It’s time for another Daring Cooks challenge — and this one was the ultimate comfort food: risotto! I used to make risotto as the vegetarian alternative for all of our family holiday dinners for about ten years, so it really says “comfort” and love to me. My goal was to make a tasty risotto with less butter, cream, and cheese than usual — something a little lighter. I managed to leave out the cream and butter entirely; the method used to cook the risotto creates a creamy texture here from the starch in the rice. Heat 2 tsp. oil in a pan and add onion. Let onion soften and become translucent. Add enough stock to cover the rice by a finger’s width (about an inch or two). is the perfect tool here to keep the rice moving and lift off any bits that stick to the bottom of the pot. While the liquid is absorbing into the rice, sautee shitakes and collard greens in 1 Tbsp. olive oil. Repeat Steps 4-5 making sure to leave aside approximately 100 ml. of stock for the final step. 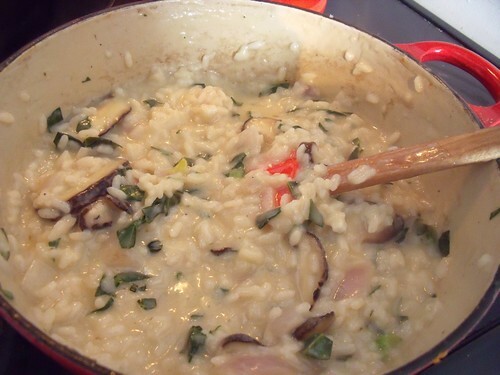 Add sauteed mushrooms & greens to the risotto. Then add the final 100ml of stock and stir until completely absorbed. Stir through the parmesan and goat’s cheese, stick the lid on and let it sit for a few minutes. This is one of the few dishes I bother with that needs to be served right away. Don’t let it sit out, or even attempt to freeze it. Cook & eat immediately, and enjoy! The lower-fat experiment worked quite well: I didn’t use any butter or cream at all, and the risotto was perfectly creamy even without the cheese. I would be happy to serve this as a vegan dish without the parmesan or goat’s cheese. 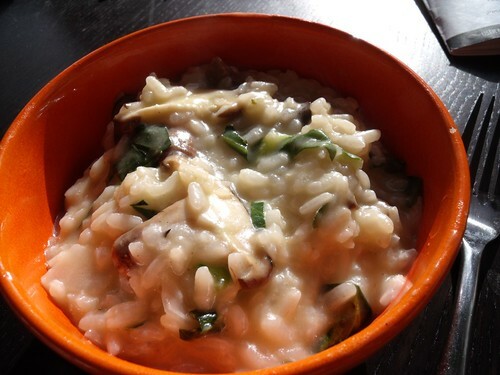 The Daring Cooks Risotto page also has recipes for Preserved Lemon Risotto, and Pumpkin Risotto. Mmm, I’ll have to try those out. But the boyfriend has even declared this recipe “a keeper”. Next time, I’m serving a whole whack of greens alongside the risotto. Wow how creamy is your lovely risotto it oozes luscious well done and without butter and cream superbly done. Cheers from Audax in Sydney Australia. That first photo is especially elegant. Nicely done! It looks really creamy.